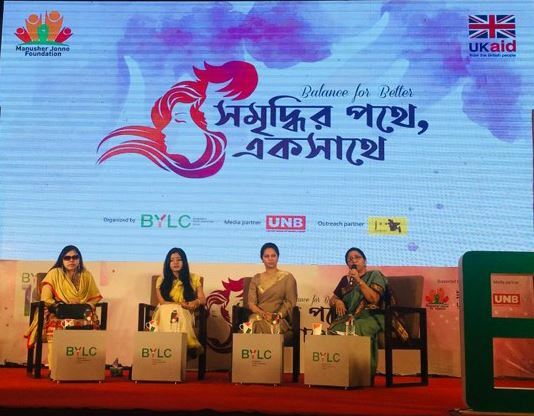 Bangladesh Youth Leadership Center (BYLC) celebrated International Women’s Day on Friday with an event named Balance For Better: Shomridhir Pothe, Ekshathe at the Krishibid Institute Bangladesh, with eight speakers and 600 participants from all over Dhaka supported by UKAid, and the Manusher Jonno Foundation. Speakers from diverse sectors highlighted the importance of the matter. The first panel, ‘Breaking the glass ceiling’ discussed the invisible barriers that stand in the way of professional success of women in the country and around the world. Shaheen Anam, Executive Director, Manusher Jonno Foundation (MJF), Anita Ghazi Rahman, Founder and Partner, The Legal Circle, Farin Daulah, Co-founder and Managing Director, Yellow Brick Road, and Adjunct Faculty, North South University, Nazma Ara Begum Poppy, General Secretary, Visually Impaired People’s Society (VIPS) and Project Officer, Handicap International spoke in the panel. The second panel, ‘Social mindset and men’s role in gender equality’ shed light on the collaboration between men, women and explored the role of men to create a gender-balanced society. Imtiaz Ilahi, Co-founder, BDRunners, and Managing Director, GraphicPeople, Farzana Kashfi, Development Activist and Ejaj Ahmad, Founder and President, BYLC spoke in the second panel. The event ended with a poetry recitation and a musical performance by Chitropot.